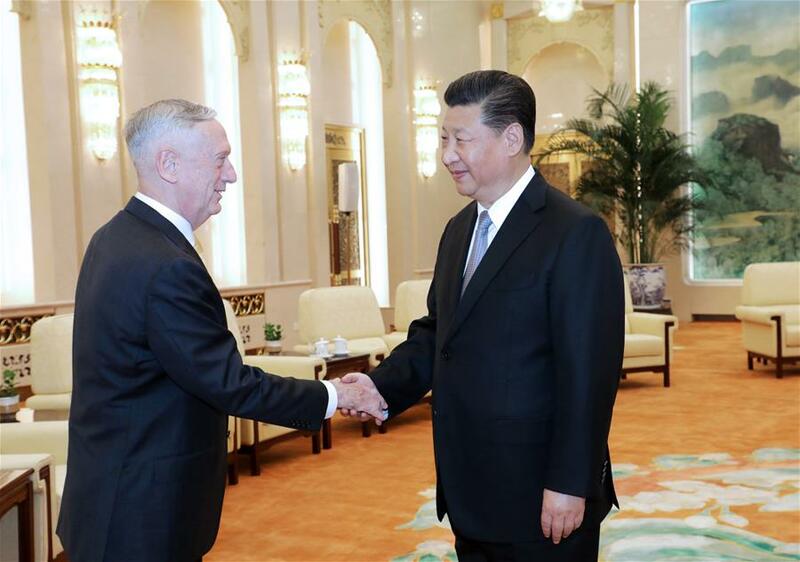 BEIJING, June 27 -- Chinese President Xi Jinping on Wednesday met with visiting U.S. Secretary of Defense James Mattis in Beijing. Xi said China-U.S. relations are one of the most important bilateral ties in the world. The history and reality since the establishment of bilateral diplomatic ties in nearly 40 years have proved that the sound development of China-U.S. ties can benefit peoples of the two countries and the world, which is also conducive to world and regional peace, stability and prosperity, Xi said. The Pacific Ocean is vast enough to accommodate China and the United States, as well as other countries, the president said. China and the United States should promote the development of bilateral ties based on the principle of mutual respect and win-win cooperation, Xi said. "When we see common interests between China and the United States, we do not shy away from differences," the president said. "Our stance is steadfast and clear-cut when it comes to China's sovereignty and territorial integrity," Xi said, adding that "any inch of territory passed down from ancestors can not be lost while we want nothing from others." As an important part of bilateral relations, Xi said military relations have maintained a sound development momentum in recent years. "It has long been known that the real experts on military affairs do not want to employ military means to solve issues," said Xi. Xi noted that enhanced military exchanges and institutional building at various levels are helpful for defusing doubts and preventing misunderstandings, misjudgement and accidents. Mattis said the United States attaches great importance to relations between the two countries and the two militaries, and military ties play a vital role in the bilateral relations. Mattis said that guided by consensus reached by heads of state of the two countries, the United States is willing to strengthen strategic communication, expand mutually-beneficial cooperation, manage and control differences and risks, and prevent conflicts and confrontations, so as to enable military relations to be a constructive factor in promoting the development of bilateral ties. Mattis conveyed U.S. President Donald Trump's greetings to Xi while Xi asked Mattis to convey his greetings to Trump. Officials including Chinese State Councilor and Minister of National Defense Wei Fenghe attended the meeting.